“Quality” was one of the themes of the 2018' China Chemical Industrial Equipment Association’s (CCIEA) National Pressure Vessel and Pressure Components Industry Conference, as nearly 600 pressure vessel and pressure component companies gathered for the event in Jinan, China. The leaders and experts from the various China inspection agencies, along with The American Society of Mechanical Engineers (ASME), and The American Society of Mechanical Engineers Personnel Certification LLC (ASME PC) took the stage to conduct the opening ceremony and deliver special presentations on the necessity of high quality, compliance to standards, greater management level involvement, and a look towards the future in pressure vessel and pressure component manufacturing. 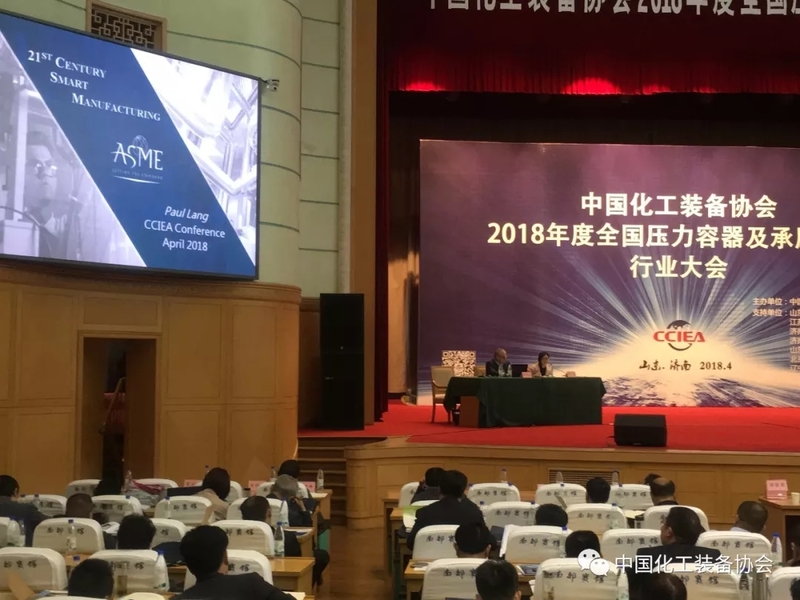 The various China inspection agencies presented their annual reports and spoke on current statistics both national and provincial pertaining to violations and pressure vessel accidents. The presentations placed emphasis on increased quality, following the rules, and relying on the association and other technical institutions, to promote the ERP system as a way to gradually improve China’s special equipment manufacturing level over the next year. Following the reports, Mr. Jon Labrador, President, ASME PC took the opportunity to give a detailed presentation on ASME PC’s ANDE Personnel Certification program titled “ASME PC ANDE – The Future of Quality NDT Personnel Certification.” It was during this presentation that Mr. Labrador thanked CCIEA for their cooperation and collaboration in laying the groundwork for bringing the ANDE Personnel Certification program to China. A review of their training facilities and program have shown their commitment, adoption, and incorporation of Job Task Analysis (JTA)s and the Systematic Approach to Training (SAT) that the ASME ANDE-1 standard requires for the training of personnel seeking an ANDE Personnel Certification. CCIEA stands ready to conduct the necessary training to support the ANDE Personnel Certification program in China. ASME is globally recognized for providing the “Gold Standard” in consensus-based construction standards along with its associated certification programs. It continues to be an international resource and neutral convener to industry in the development of standards and the promotion of new technology. As part of its mission and outreach, it regularly convenes Technical Advisory Panels (TAP) sessions with industry to gauge the development and use of new technology in the key areas of Manufacturing, Pressure Technology, Clean Energy, Bioengineering, and Robotics. It is also involved in those cross-cutting technologies such as Internet of Things (IoT), Big Data Analytics, Artificial intelligence, Cybersecurity, Sustainability, Materials, Nanotechnology, and Design Engineering that supports smart technology initiatives in those key areas. ASME participates in conferences and workshops all over the world to educate and promote its Standards,Certification Programs, and Learning & Development opportunities.